In the first episode of Back in Time for Dinner, the Campus family struggles with almost every aspect of 1940s living, from uncomfortable shoes to rigid gender roles to a lack of video games and TV. In 1941, only 21 per cent of Canadians have a refrigerator. A quarter of the population has an icebox; a small cupboard where foods were kept cold by a big block of ice, stored in a separate compartment. Just under half of Canadians have no refrigeration at all. What's more, only 40 per cent of Canadians have an electric or gas stove; everyone else uses wood, coal, or oil. More than a third of Canadians still don't have running water. With meat being rationed and the choicest cuts being sent overseas to soldiers, organ meat becomes a key part of Canadian diets. Tripe (stomach), kidneys, tongues and livers all provided protein on the home front. After making their labour-intensive dinner, Canadians render the fat from their meal and then put it in a donation bucket to help the war effort. Bones go in another bucket. The fat is turned into glycerine to be used in munitions while the bones are made into industrial adhesives. Canada isn't just feeding itself, but much of Britain, too. Britain gets an impressive 77 per cent of its wheat and flour from Canada. They also tap us for 39 per cent of their bacon and 15 per cent of their eggs. The US and Canada are also sending Britain nearly all of their frozen meat. Haven't had enough to eat? Too bad! With all of that food going to the war effort, there isn't much left to go around at home. Canada is put on a coupon system which rations out meat, sugar, tea, coffee, butter and preserves. Rationing means that a portion of meat that might serve two people today would be stretched to feed a family of five. The government mandates meatless days at restaurants and limits what canned goods can be sold in stores. Another way of dealing with rationing is to grow your own food. Canadians start growing Victory Gardens — small, urban vegetable patches — to help provide nutrition for their communities. By war's end, there are over 200,000 of these across the country. Here's a conundrum. The government has imposed rationing but also needs its citizenry well-fed and strong enough to keep producing new soldiers. How do you square that circle? In 1942, they released Canada's Official Food Rules. The Rules, which were the grandfather of today's Canada Food Guide, laid out six "health protective" food groups — milk, cereals and breads, meat, fish, fruits and vegetables, and eggs — and told people how much of each group they should consume each day. The guide had some problems; it was written from an entirely Anglo-Canadian standpoint. It paid no mind to the dietary traditions of different cultures. For example, it ignored the fact that many cultures — including First Nations, Inuit, Japanese-Canadians and Chinese-Canadians — traditionally don't eat dairy. Other things in the guide were just plain weird; a 1944 update had butter under "cereals and breads," rather than dairy. Celebrating victory with higher prices? The end of the war meant an end to rationing. Canadians could finally get their fill of meat, eggs and sugar — provided they could pay for them, of course. The end of the war also meant the end of government price controls. 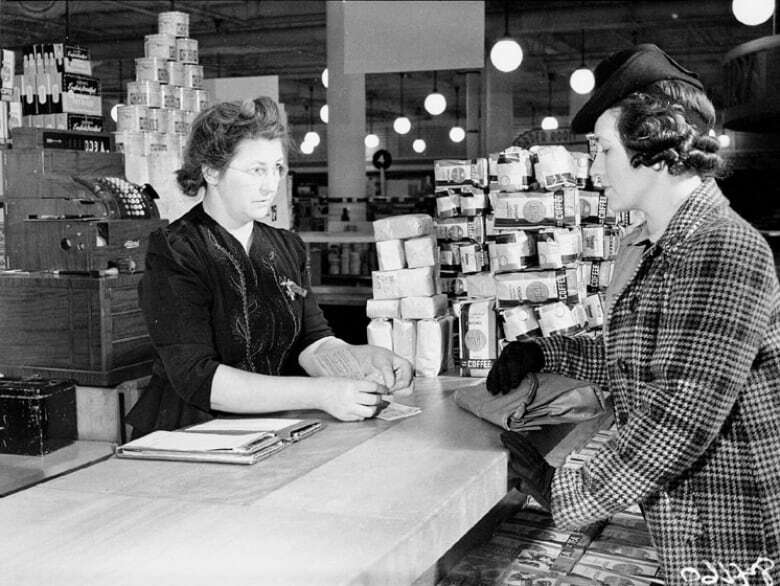 In 1940, the average middle class family spent $106 a month on food. By 1947, that had jumped to $158. Watch Back in Time for Dinner on CBC as The Campuses — a modern, middle class family of five — take on the unique experiment of living through past decades of Canadian life, starting with the 1940s.